Why Is Buying a Car with a Salvage Title a Good Idea? Working on your own car isn't as common as it used to be, but that doesn't mean you have to run to a professional mechanic every time your car hiccups. There are still plenty of late-model used cars floating around that you can fix yourself without an engineering degree. They might not be the most advanced or exciting models on the market, but they offer you the chance to save thousands on maintenance and repairs. Used for years by taxi operators and police departments, the Crown Victoria is a husky full-size sedan with an uncomplicated rear-drive layout and trusty V8 engine. Parts are generally inexpensive and remain widely available. Civilian models tended to attract elderly drivers when new, so plenty of gently used examples can be found. Retired police cruisers and taxicabs have seen years of heavy duty, but some buyers actually prefer them for their lower price and beefier underpinnings. The Crown Victoria and its slightly fancier twin, the Mercury Grand Marquis, were last produced in 2011. The traditional open-air Jeep has always been easy to tinker with. Aftermarket parts and accessories are abundant and relatively hassle-free to install. The classic design allows for plenty of elbow room under the hood and the layout is about as straightforward as it gets. Although the Wrangler has received countless technical upgrades over the years, you'd be hard pressed to find another vehicle that's as user-friendly to weekend mechanics. A top-seller for decades, Toyota's compact sedan has become the poster car for trouble-free transportation. 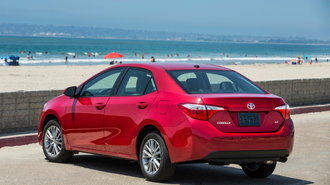 The Corolla shuns the latest technology in favor of proven mechanicals that work as intended for years on end. Since there's nothing dazzling going on under the hood, most common repairs can be accomplished with a manual and a good set of wrenches. Of course, work space isn't great on a car of this size, but the Corolla is far easier to navigate than its main competitors. Parts on are on cheap side and very easy to find. Chevy's full-size pickup relies on conventional technology, body-on-frame construction, and rear-wheel-drive architecture. That not only makes it incredibly durable, but also easy to approach with your toolbox. The cavernous engine bay provides plenty of room to work, and major components are easy to identify and access. Since the Silverado posts huge sales year after year, parts are readily available on the shelf. Toyota's midsize pickup hasn't changed much over the years, which is a good thing when it comes to tackling do-it-yourself repairs. Mechanically speaking, the Tacoma is the same as it was a decade ago and just as popular. Pop the hood and you'll find scads of open space and a logical, uncluttered layout. Problems are easy to spot, and swapping out parts is blessedly simple. To us, the Tacoma is the epitome of an easy-to-work-on used vehicle.